One of the most beautiful cathedrals of Saint Petersburg, the Savior-on-the-Blood was erected on the place where Russian Emperor Alexander II was murdered on the 1st of March, 1881. 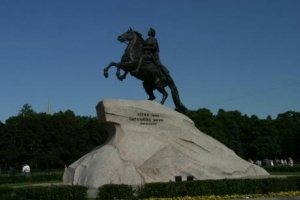 The tsar was mortally wounded by the terrorists from the People's Will revolutionist organization. Already on the next day the Municipal Duma on its extraordinary meeting decided to construct the cathedral to commemorate the tsar-liberator. Soon the architectural contest was declared that was won by architect Alfred Parland. He worked together with the archimandrite of the Troitse-Sergiev Lavra, Ignatiy. According to the legend, the archimandrite saw in his dream the Virgin who showed him what the cathedral should look like. 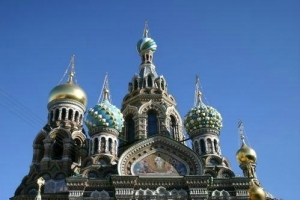 The cathedral was constructed in the style of the 16th-17th century Russian architecture and has a lot in common with the Church of St. Basil the Blessed that stands on the Red Square in Moscow. The Cathedral of Our Savior on the Spilled Blood stands out for its complicated and picturesque outline, as well as rich and multicolored decoration on the background of the austere Petersburg church architecture. The rich mosaics that cover the walls of the cathedral both inside and outside are of a great value. The mosaic panels were made in Frolov's workshop to the originals by outstanding Russian artists, including Vasnetsov, Nesterov, Riabushkin and others. The total area of the mosaic is impressive 7,050 square meters. In the decor of interiors Italian marbles and Russian semiprecious stones, such as jasper, topaz, rock crystal and others are used. On the socle of the cathedral, there are 20 granite desks, dedicated to the major events and reforms of the ruling of Alexander II, and on the belfry there are coats of arms of all the regions and provinces of Russia. The height of the tallest dome is 81 meters. The domes are gilt and covered with colorful enamel and the one over the altar is adorned with golden smalt. 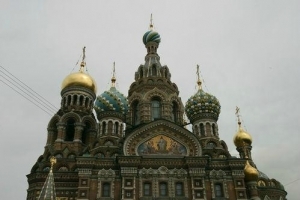 The cathedral comprises the place, where the tsar was murdered. One can see the preserved fragments of railings and the pavement and some cobblestones of the carriageway where the Emperor fell bleeding profusely. The Savior-on-the-Blood was greatly damaged under the Soviets. Like many other churches in Saint Petersburg it was closed soon after the revolution of 1917 and for many years was used as a storehouse. By the late 1960s the unique monument of Russian architecture had been in drastic condition and in 1970 the restoration works that lasted for almost 30 years were started. Such duration of the restoration was difficult to explain and people talk that unless the scaffolding stood, the Soviet power would last. It is strange but the scaffolding was taken away in 1991 short before August crises in Moscow. Thus the prophecy turned to be true. The Cathedral of Our Savior on the Spilled Blood is separated from the Mikhailovsky Garden with the railing made in 1903-1907 on the Binclers' manufactory after Parland's sketches. The wrought links with plant ornament reminds the samples of early modernism. 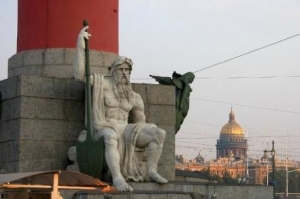 This railing decor masterpiece turned into a recognizable symbol of Saint Petersburg.